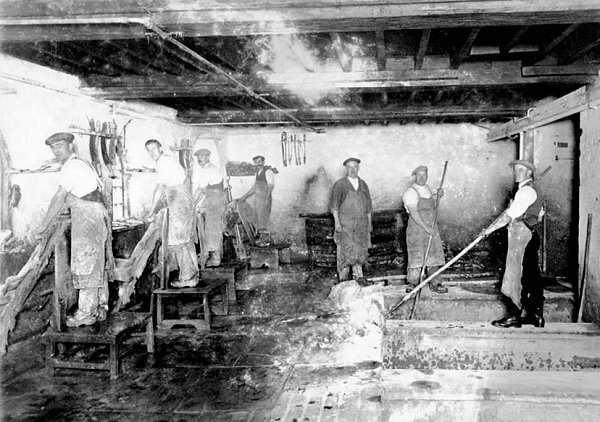 Blake & Fox were leather dressers and glove manufacturers throughout the first half of the twentieth century with a large factory and dressing yard in Summerhouse Terrace. 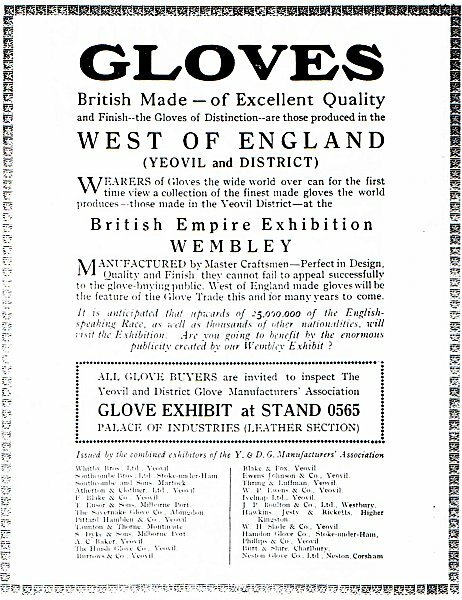 The company, as a member of the Yeovil & District Glove Manufacturers' Association, exhibited in the Glove Exhibit stand of the 1924 British Empire Exhibition at Wembley, London. 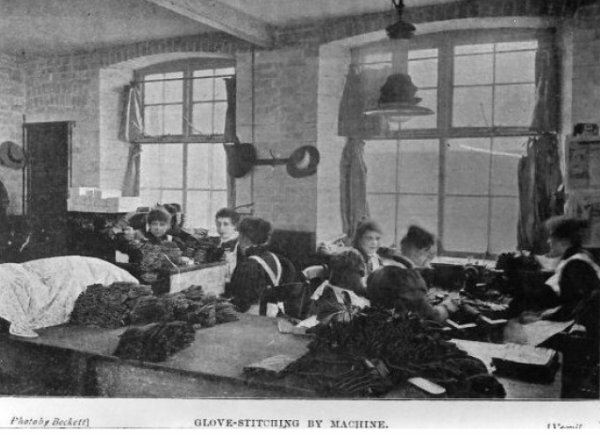 They were listed as Glove Manufacturers of Mill Lane in Kelly's Directory of 1919 and in Kelly's 1935 edition as Glove Manufacturers of Summerhouse Terrace. There were two entries in Edwin Snell's Directory of 1954; one as Leather Dressers and the other as Glove Manufacturers of Summerhouse Road (sic). Despite this there is hardly any information in the records of the company. 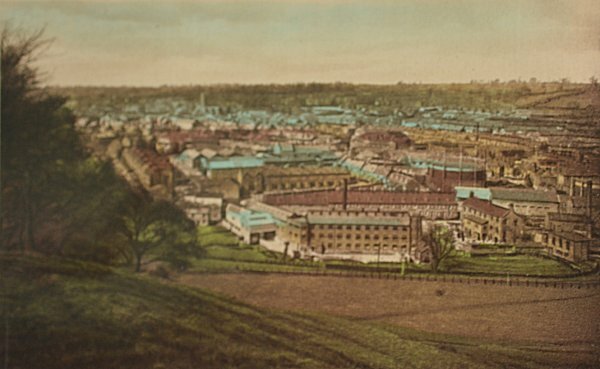 A hand-coloured postcard view from Summerhouse Hill dating to about 1910 with the large Blake & Fox glove factory in the middle ground that was built on the site of old allotments. A full page advertisement from the June 1924 edition of "The Glover" listing those local companies taking part in the British Empire Exhibition at Wembley - including Blake & Fox. 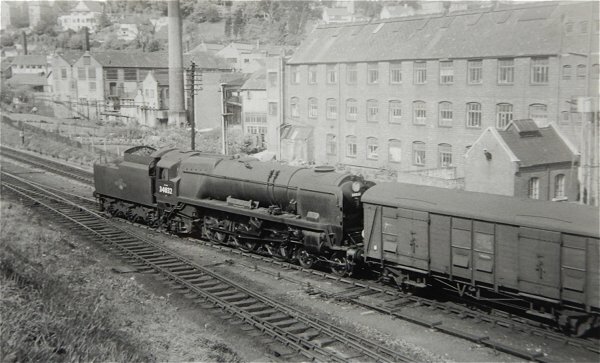 Locomotive 34032 Camelford on the Yeovil Town station sidings behind the Blake & Fox glove factory in Summerhouse Terrace during the 1960s. 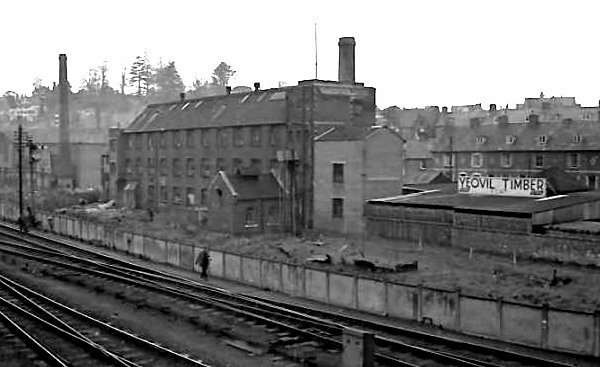 The Blake & Fox factory seen from Dodham footbridge in the 1960s. At right, Yeovil Timber became Woodlands timber yard of the following photograph. Photographed from Stars Lane in 1985 - the view across Stars Lane car park after the demolition of the houses in Summerhouse Terrace. All the buildings in this photograph were demolished. 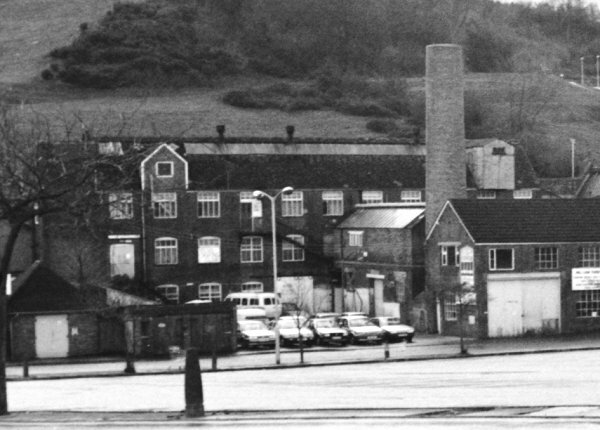 At extreme left is Woodlands timber yard, earlier known as Yeovil Timber, that was situated immediately next to Foundry House and the remaining buildings became known as Foundry House Trading Estate. 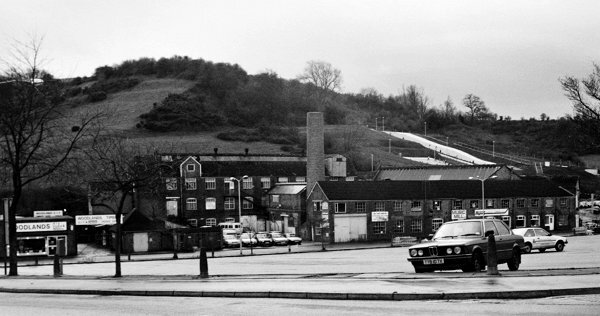 At the rear is the Blake & Fox glove factory, at right background is the (now defunct) ski slope on the side of Summerhouse Hill. The centre section of the previous photograph enlarged to show the Blake & Fox glove factory. .... and photographed in colour in 1984. 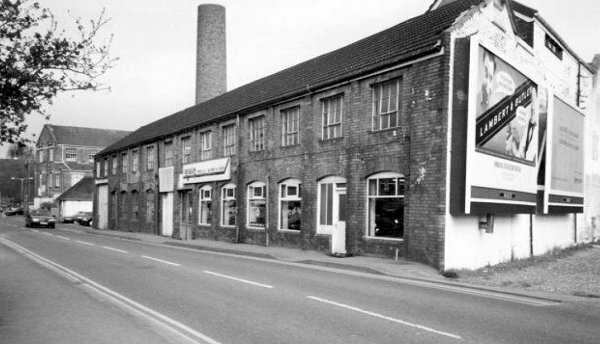 Photographed in 2000, the old Blake & Fox factory was being used by Riders of Yeovil for motorbike sales and next door, I seem to remember, was a music shop called the Music Mill in the early 1980s that my dad always used to visit when he came to Yeovil. This photograph of 1924 is of Blake & Fox's leather dressing yard where the men are working at the soaking and lime pits. Many thanks to Roger McElliott for the following - "This photo was enlarged to life-size and was on the wall of the museum when it was in the Coach House in Hendford. 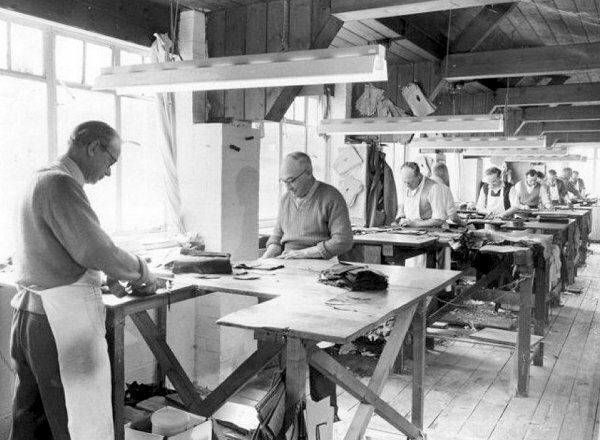 The leather worker standing on the wooden platform on the far left, closest to the camera, is my grandfather William 'Bob' Norris who worked as a leather dresser for over 45 years until he had industrial dermatitis on his hands and arms and had to give it up." 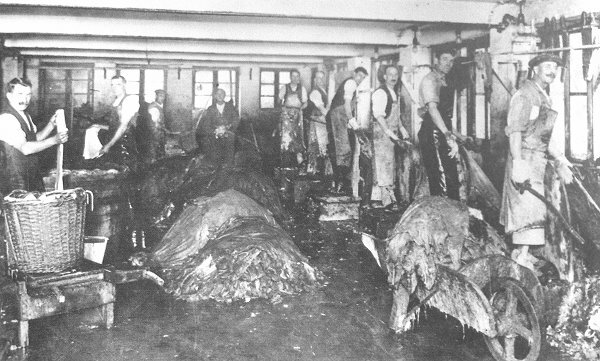 Again photographed in 1924, this was the unhairing department where skins were scraped free from flesh and hair before going on to the stretching process. 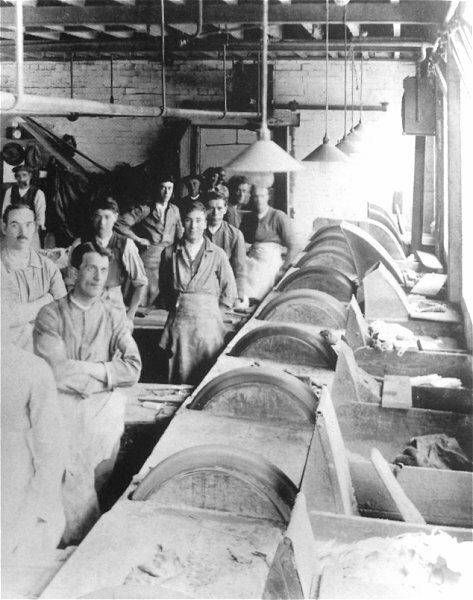 The Blake & Fox wheeling department in which leather was given a final treatment before being passed on to the glove cutting department. 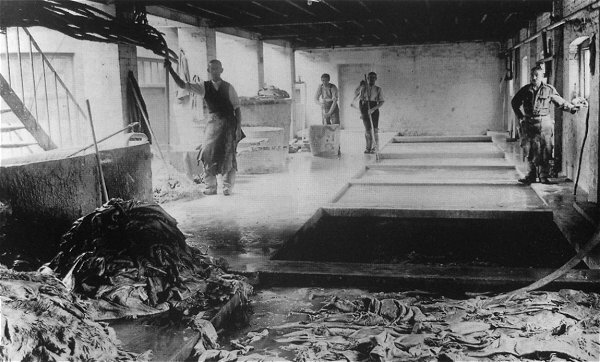 The cutting room of Clothier & Giles' glove factory, presented here to give a continuation to the glove-making process, photographed in the early 1960s. A postcard dating to the 1920s of the glove stitching room, thought to be that of Blake & Fox.